Some recent knockabout on twitter reminded me that I hadn't mentioned running in a little while. Well, I haven't blogged at all for some time, due partly to a lack of material and perhaps more to a lack of computers and internet. Our second computer arrived safely in one of the boxes a couple of weeks ago (we had a mild panic when we realised that it was not listed on the manifest, but it turned out to be disguised as a bit of padding in the bottom of the box with the monitor) and the internet problem has been addressed (I hesitate to say solved) for now by a mobile phone on the 3 network. This can just about pick up a signal at home in the deepest Lune Valley and broadcasts wifi throughout the house, though it grinds to a halt with tedious regularity whenever jules and I are both surfing working at the same time. I thought I should take advantage of my marathon training by entering some other events while I was still reasonably fit. In particular, I'd had my eye on completing a 10k in less than 40 mins for some time, but had not really had a good racing opportunity. Given that we were going to be staying about 15 mins walk away, the Ayrodynamic Boxing Day Turkey Trot up and down the seafront seemed like an obvious choice. All the packing and moving meant that we weren't really well prepared, and the horrible weather had further limited our running, but amazingly it cleared up for the morning of the race and both jules and I ducked under our optimistic targets of 40 and 50 mins respectively. Oh, I just see on re-reading this post that this was my New Year resolution for 2013, achieved in the nick of time! The UK events have been an interesting contrast from the Japanese ones we have participated in. There's been rather less in the way of organisation and marshalling here - the first sign we saw yesterday was after we had already arrived at the race HQ, and even once inside the building it took several attempts to find the seemingly mythical changing area, due to the combination of plainly incorrect directions which we were repeatedly given, and a complete absence of any signage. Hardly anyone else found it either, it wasn't just our incompetence. The start time was also rather approximate, with the starter choosing to give a eulogy to some local footballer for reasons unknown, while we were shivering at the start line. But the races themselves went smoothly enough, and the courses have both seemed to be a touch on the short side (according to our Garmins) in contrast to the Japanese ones which were invariably long. No pics, I'm sorry to say, as we were both running and there was also nowhere secure to leave stuff. I usually get lost in the wiggles and weird nomenclature of paleoclimate data papers and presentations. Most seem to require some magic eye or inner sight, that I am sadly not gifted with, to see the climate signal. All I usually see is “noise”. 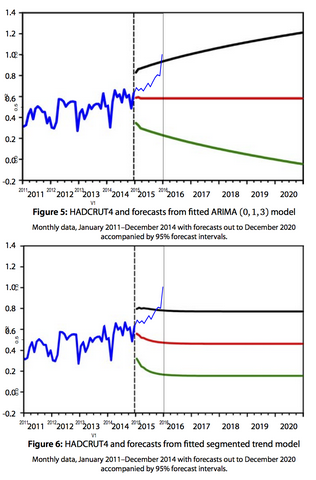 This figure, however, is beautifully informative to this non-expert of paleo-data. Perhaps such figures are old hat. I probably need to get less tl;dr. Even for this one, you have to get through 7 pages of weird wiggles before it appears, on page 8 of the 12 page paper. TANŢĂU, I., FEURDEAN, A., DE BEAULIEU, J.-L., REILLE, M. and FĂRCAŞ, S.: Vegetation sensitivity to climate changes and human impact in the Harghita Mountains (Eastern Romanian Carpathians) over the past 15 000 years, J. Quaternary Sci., n/a–n/a, doi:10.1002/jqs.2688, 2014. 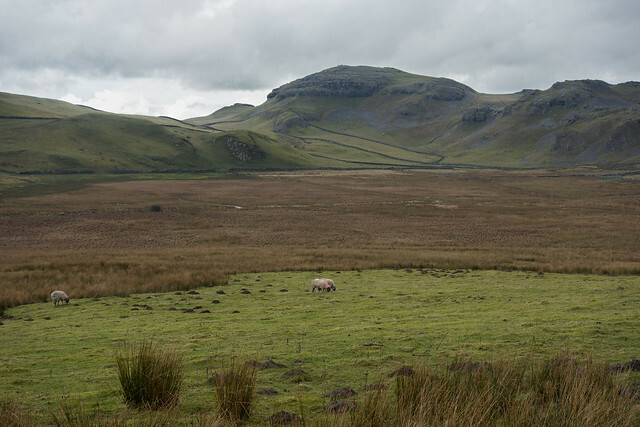 Whernside and Ingleborough, are two of the "three peaks" of North Yorkshire. They aren't really peaks at all, but that makes the area all the better for mountain biking. 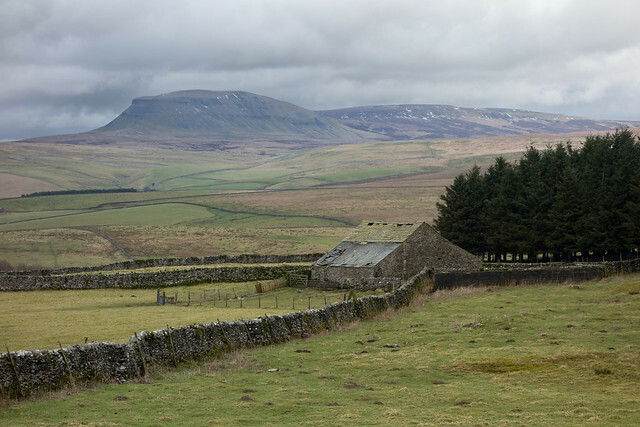 Today we finally got our act together sufficiently to view the third peak, Pen-y-ghent. This view was thanks to The Return Of El Conquistador, the mountain tandem. 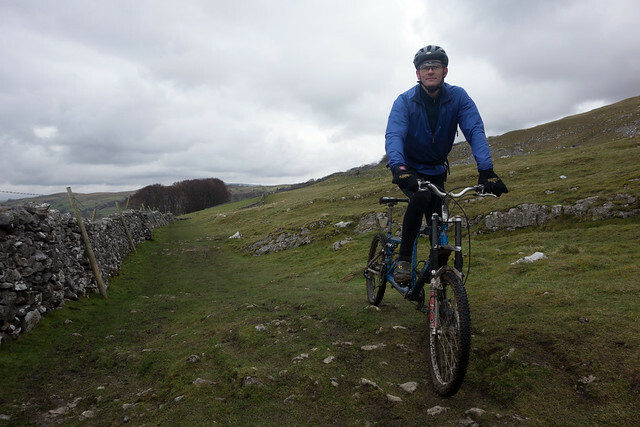 James now thinks he wants to live in Settleswick (Settle or Giggleswick), which is a place that is close to a lot of this mountain biking. Apart from the colour of the sky, the surrounding landscape is surprisingly Wyoming like, with tufty grass, cliffy hills, and pronghorn antelope sheep everywhere. 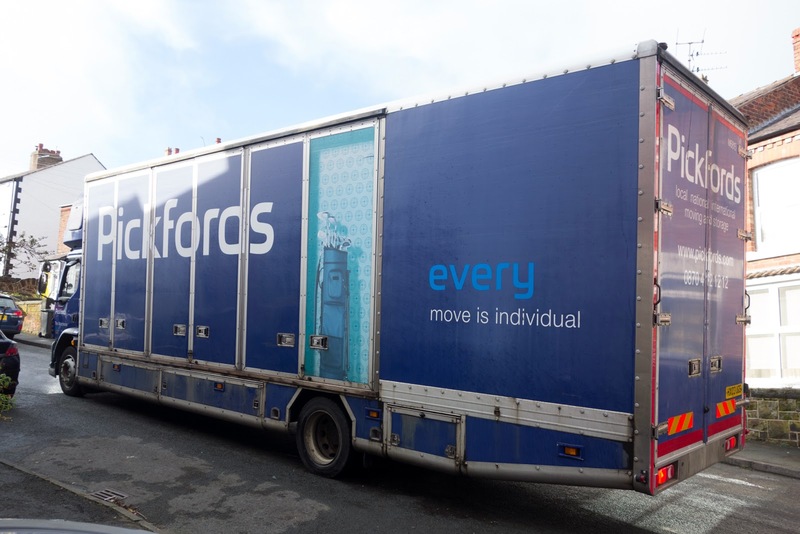 That our attempt to release 143 ocean tracers had completely failed was finally confirmed by the arrival of three men and a massive truck. After the deft execution of some extreme parallel parking they unloaded all the boxes, over the next hour and a half. We couldn't even offer them a cup of tea as the cups were, at that stage, buried in the curiously labelled boxes, tea is something that one is not allowed to ship from Japan to the UK, and our kettle only runs on 110Volts. As for the curiously labelled boxes, they provided some on the job entertainment for the three men, who, by the end were skeptical about what may actually be inside our boxes. Does anyone know what a "glay cabinet" is or even a "water tunk"? I suppose we will find out in due course. Over the next few hours we created a box city. It is modelled on Tokyo, which also has numerous little districts devoted to peculiar hobbies. So far we have found no damage apart from one flat bicycle tyre. Fork oil leaked out of one of our tandems, probably as a result of being stored vertically. But it was so well packed that no oil escaped the tandem's packaging. Other than that, things seem in a rather fresher condition than when they left Japan. My impression is that things got freeze dried. Rather than buy mould insurance we invested in some dehumidifying columns in our container. It could be that they worked - as the ship headed towards the equator the stuff could have heated up and the moisture evaporated and been absorbed by the columns, so that it did not recondense when the ship headed polewards. 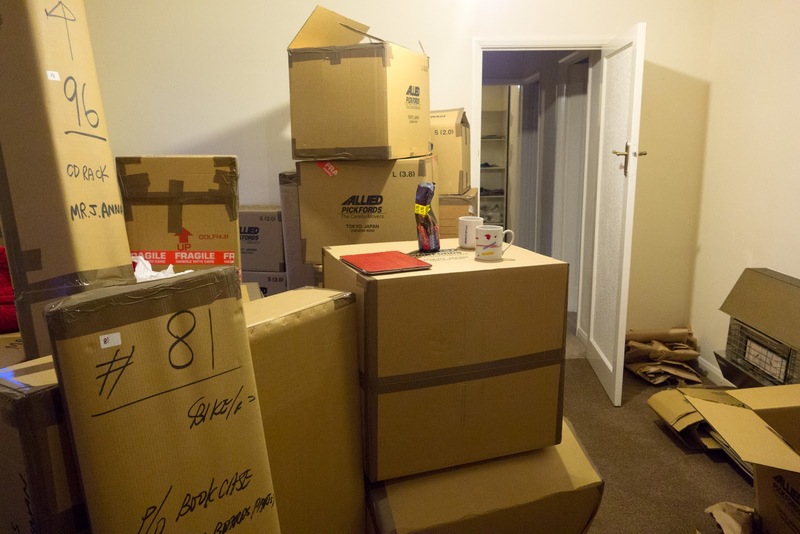 Unpacking is like a very disappointing Christmas as everything is wrapped in lots of tissue paper so that it is not recognisable. The packers packed everything with the same care, which is probably a good policy, as it isn't for a packer to judge the sentimental value of people's rubbish. Thus my best camera lens was as well packed as the pair of used ear plugs that had been left on the sideboard. [jules' pics] Wot no camelia? Culture shock continues unabated. "Normally" at this time of year the grass is brown and the hedgerows full of common-or-garden pink camelia. 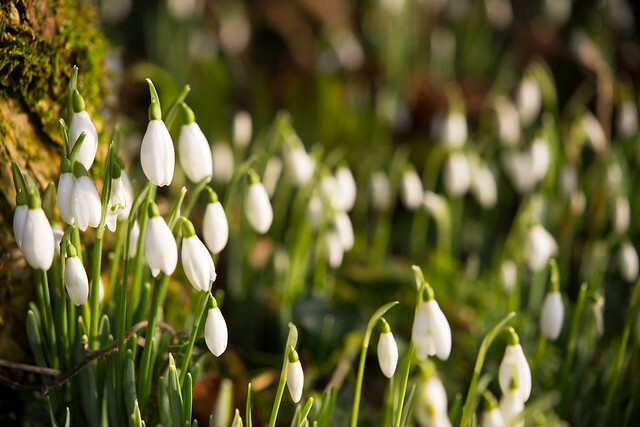 Instead zillions of white snowdrops are poking through the luminous green grass. The snowdrop previously featured in this blog in November(!) 2009, when we found a small patch of them in Jomyoji English garden. I wonder in which months the camellia will flower here in ole blighty. We also "normally" have about 6 weeks of almost no rain at this time of year. I'm not sure, but this year so far there may have been about one day when it did not rain. That isn't to say it rains all the time, and indeed the rain is much lighter than Japanese rain. For example, we've done quite a lot of running and cycling have only got properly wet while running once and not at all while cycling.